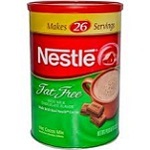 Nestle (USA) specializes also in cocoa powder mixes. 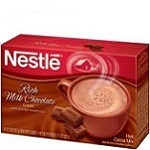 See 1574+ Nestle Hot Cocoa Mix Reviews and save an extra 10% on Nestle Hot Cocoa Mix with Coupon Code* YAG250 at iherb.com/Nestle-Hot-Cocoa-Mix?rcode=YAG250. 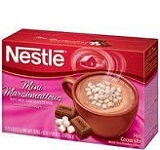 Nutrition: Serving 20 g, Calories 80, Fat 2.5 g, Carbs 14 g, Fiber <1 g, Sugar 12 g, Protein 1 g.
Ingredients: Sugar, corn syrup solids, vegetable oil (partially hydrogenated coconut or palm kernel and hydrogenated soybean), dairy product solids (from milk), cocoa processed with alkali, marshmallow (sugar, corn syrup, dextrose, modified corn starch, gelatin, artificial and natural flavor, sodium hexametaphosphate), calcium carbonate, and less than 2% of salt, cellulose gum, sodium caseinate, dipotassium phosphate, sodium citrate, guar gum, nonfat milk, sodium aluminosilicate, mono-and diglycerides, artificial flavors, sucralose. Made on equipment that also processes soy and wheat.